17:03 | Guangzhou (China), Nov. 6. 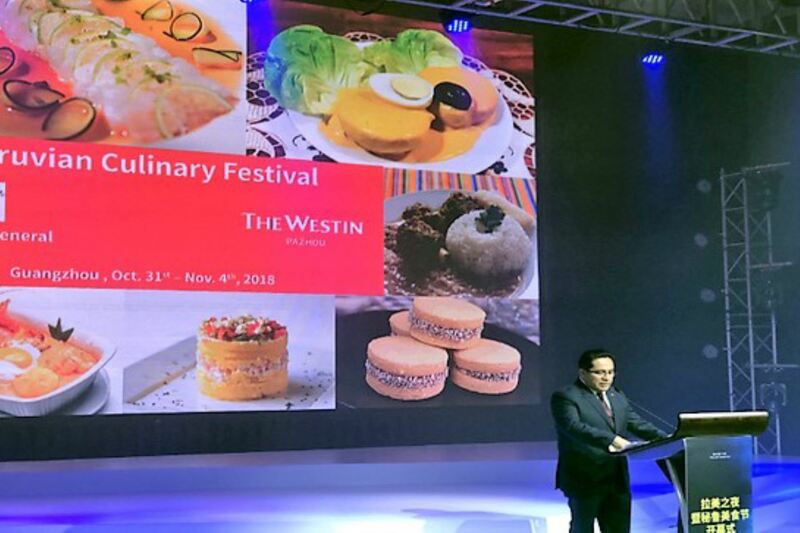 A Peruvian Gastronomic Festival was held at the Westin Guangzhou Hotel on October 31-November 4. The gathering was hosted by Chef Maria Vasquez. On this occasion, the ingredients had been brought from Peru. Therefore, the food was an accurate representation of the South American nation's rich gastronomy. The inauguration ceremony was presided over by Consul General David Gamarra, who mentioned the conditions that had helped Peruvian cuisine become famous on a global scale. Within this framework, he indicated the Inca country's natural diversity, millenary history, and national multiculturalism are its central axes. Over 400 people attended the event, including Consulate members, as well as Chinese and Peruvian authorities. Attendees made a toast with Pisco Sour. They were also able to taste dishes and desserts such as Ceviche, Lomo Saltado (Peruvian-style steak stir-fry), Chupe de Camarones (crawfish soup), Picarones, and Suspiro a la Limeña, among others.